1. 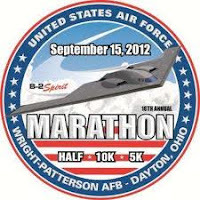 I'm scheduled for my last "long" run this weekend before my first ever, full marathon in mid September, the Air Force Marathon. It's actually quite daunting. I've done 16, 18, & 20. I'm scheduled for 20, but I don't like doing 6.2 less miles than the actual marathon. I would like to know what to expect, ok, NEED to know what to expect. I don't care what anyone says, 6.2 miles is a whole lot of extra miles after you've just done 20. Twenty and 26.2 is a big difference between finishing or not. So, I'm going out for a minimum of 20 and hoping for more. I got lucky with my last 20 and had great temps in the early a.m. I'm not expecting that luck again. I've discovered the temps can mean all the difference in the world on these long runs. 2. I think I've become race obsessed. I scour the internet looking for local races to fill in EVERY weekend. Someone, pull away the keyboard. I might need an intervention. I get a tad excited when a race I'm interested in, comes up on one of the deal sites, such as Groupon, Living Social, etc. Hey, this addiction is an expensive one. I need all the help I can get. 3. My oldest offspring just started college this week. I'm definitely proud of her. She's learning to maneuver a large city campus where parking is a nightmare. Keep in mind, she hates to drive. She's accident prone, is a nice way to express it. 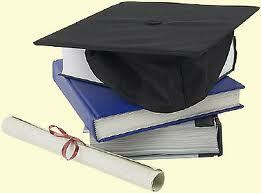 She's coming home every night and hitting the books. She also made sure that she only works on the weekend so that she can prioritize her grades. She's making sure that all tuition unpaid for by scholarships is getting paid on time with her own money. She's growing into a fabulous, young women! In general, we eat healthy in our household. I can't tell you how many times the kids have said "We don't have anything to eat in this house! ", only because there isn't some easy convenient, boxed & processed food occupying the pantry. I attempt to stock the house with mostly fresh fruits and vegetables and real-not boxed or bagged, lean meat. As the mother of three teenage children who absolutely have a mind of their own and think a gourmet meal consists of a big, fat juicy hamburger on a white bun with fried french fries, making meals that everyone will eat without "whining", can be a challenge. Last night's dinner fit the bill, kind of. Full of nutrients and antioxidants, YUM! Last evening's vegetables consisted of squash, zucchini, grape tomatoes and spinach. I didn't hear much grumbling over these, except for the one offspring who was caught by his sister eating only the inside of his squash. When she addressed him with his odd eating technique across the table, he insisted the outside of the squash was nasty. He could only eat the insides. Whatever! I made chicken fettucini alfredo utilizing a whole wheat fettucini made by Al Dente. They have a variety of whole wheat products. They are a tad expensive, but I'd rather pay for better quality & healthier food than someones blood pressure medicine & other medical expenses stemming from poor heating habits. I digress....Ok, back to the fettucini. Yes, I'm very aware alfredo isn't exactly the healthiest pasta sauce I could have chosen. The green & red peppers before I added the alfredo. Please remember, I'm dealing with three hormonal and often moody teenagers. I must compromise where I'm able, and all is in moderation. Besides, I added some more vegetables, red and green peppers to the sauce. We have one vegetarian in the household, my oldest son. That's why you see the chicken separate and not mixed with the vegetables that are added to the sauce. Cooking for two separate groups can sometimes be a little difficult. It's really not that hard, most of the time. If I'm cooking a meal where the meat would usually be mixed with something, I just cook it separate, serve the vegetarian version first. Then, I mix the meat with the remaining. I often substitute his protein with some other non-meat version. Proof that I can cook! I always say that I hate to cook. Most people take that as I can't cook, which is not true! 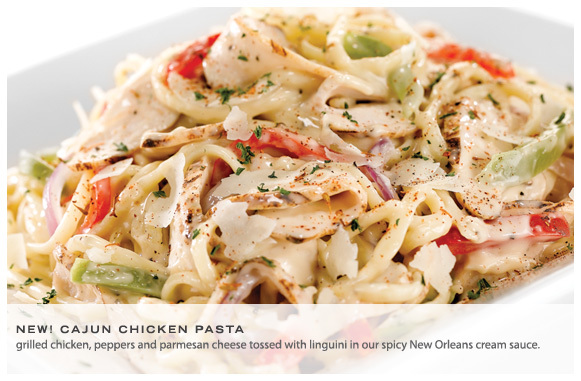 The chicken fettucini alfredo always goes over well here, even if one particular child is trying to scrape out the red and green peppers. Yep, that's the one, the same child who was only eating the inside of his squash. I always make double the fettucini when I make it. I know it's a leftover that will get eaten, if not by the kids, by my marathon training self who will currently eat all the whole wheat carbs she can get. resort to making them homemade. Considering most vendor bought smoothies are $5-$7.00, as most homemade food, it's obviously cheaper anyway. Who doesn't like cheaper? I was in a hurry this morning as I had decided last minute to squeeze in a 5 mile run prior to heading into work. So, time was lacking, yet I needed to feed myself before leaving. Just say my fridge and pantry isn't full of convenient foods, as I try to avoid boxed and processed junk. sure to fail on the fat and calorie intake. I know what you're thinking. What is wrong with you that you can't survive 4 hours without eating? I've often questioned whether I should get tested for worms or some other disgusting stomach eating virus. Just say I need to eat often, all day long. I'm sure part of this is the recent marathon training. I often joke that I feel like a newborn. I only want to eat and sleep. I've seen and read numerous smoothie recipes on-line that included spinach. Knowing that I have the largest bag of spinach in the fridge known to man-kind, I figured I would make use of some of it and knock out a meal replacement all in the same efforts. Here's what I threw together in a jiffy into my big old Cuisinart blender. I was honestly surprised to see that my smoothie ended up a pinkish-brown color when done. Most of the smoothies I've seen that contain spinach are quite green. Either others are putting a lot more spinach in it, or my raspberries bled more pink than my spinach did green. Regardless, the outcome wasn't bad. It wasn't as sweet as I expected, which is a good thing for me. I'm not fond of the overly sweet and sugary tasting. I'm sure many would prefer a sweeter flavor, but this was perfect for me. I'm sure if you are one that prefers the sweeter taste, you could probably add more raspberries. As many other spinach smoothie recipes have stated, you truly cannot taste the spinach. I promise I'm not lying. I wouldn't lie to you to get you to eat something. I would only lie to my children. I take small snacks to work to survive my long, drawn out 4 hours of starvation. I usually nibble on bananas, carrots & hummus and similar healthy type foods to survive, but this is usually after eating lunch prior to heading in. The smoothie kept me satisfied as if I had eaten a regular meal, in addition to my other snacks I carried in with me. I think I owe this to the high protein content you get from the Greek yogurt. Off to cook dinner and lie to my children about what vegetables I hid in the pasta sauce! Let me start out by saying I've never done a TRAIL half marathon. All I can say is, what a difference there is from the road half to the trail. I'm sure the excessive humidity that drenched my clothes had quite a bit to do with it, but it was rough. I've done trail runs before, just not the half and not the half in record humidity. I remember running down a significant downhill just to be payed back for it immediately with a more significant uphill within the first mile or 2. Thanks Planet Adventure, I love you too! This was just at the beginning when must runners had yet to disperse and quite a bit of the first few miles were single file, which isn't great for your splits, but hey; I now appreciate the opportunity to walk right off the bat. Otherwise, I would have done it sooner than later, regardless. I remember looking at my Garmin at 5.73 miles and thinking, seriously.....no way in he**! I feel like I've just done 10. I'm in trouble. Too bad I was too hot & already tired to remember that the beginning of all of my runs feel awful up until mile 3 or so. I don't know what it is, but I've always had this "not ready to run" feeling in all of my runs, road or otherwise until my body has had the opportunity to get warmed up to the idea until about mile 3ish. Just say today took a lot longer to get that "I can finish this" warm and fuzzy feeling inside. At some point, we were running a gravel trail that took us through the middle of Eagle Creek Reservoir. I said out loud to a fellow runner, I wasn't sure what was holding me back from taking my shoes off and jumping in. I seriously had the overwhelming desire to jump in but knowing the Eagle Creek Beach had closed due to the serious drought and that it was a health issue, I refrained. I think this where I had seen a fellow runner from Daily Mile and had recognized his shirt and bald head that he indicated in a post would make it easy to spot him. It worked. So I said a quick introduction and kept moving, slowly. Our trail took us out to the road for some quick easy running and back down to the other side of the park. I had finally got comfortable with the run and was more confident I was going to complete this thing. I had seriously doubted myself prior to mile 6. I attempted to keep up my pace as well as I could after already exhausting myself on uphills and downhill inclines and stepping over numerous fallen trees. I didn't want to go too fast on the flat stretches in my goal to maintain some energy for any future rough terrain. DONE AND 1 YEAR OLDER! I walked, I ran, I climbed and I finished. I have to give my hats off to the Planet Adventure organization. As I got into the car, I told my husband that this was my first half ever, road or trail, that I didn't feel seriously sick to the point of just wanting to go home and die. Why do I think this? Potatoes! Yes, I said potatoes! I am unable to utilize GU or any other form of heavily laden sugar in energy packets, etc. As I've said before, just like with drinking Gatorade, I would be running for a whole other reason. Yes, that reason! Planet Adventure had little small cooked, salted potatoes at the water stops. I'm almost positive this is the sole reason for why I feel just fine right now, well, besides my knees. Now if I can just figure out how to carry cooked small potatoes on my runs. race bling as some of you call it. I prefer medal. I collected my "medal" at the finish line. It was quite unique, at least unique to my collection. It is part of a tree with the medal attached. Kind of cute. My Garmin says I ran 13.4 miles in 2:56:51. I left before finding out what Planet Adventure says I ran. I'll have to let you know. Oh, yes! I almost forgot to tell you. It's my birthday. I'm 39! No, I'm not lying. I'm really 39. No, I haven't been 39 for 5 years. I'll be 40 next year, promise! Happy Birthday to me! I couldn't have started it a better way than a hard as heck trail run, right?! In case you don't know what the R.A.I.N. ride is, I'll tell you. Once a year, approximately 1500 crazed cyclists ride their bicycles across the state of Indiana covering 160 miles from the city of Terre Haute to the other side, ending up in Richmond, all in one day. Why? For the fun of it and because we can! Just say, if the condition of our hotel upon our arrival had any bearing on how our weekend was going to go, I would have up and quit before I even started. While checking in, I was kindly informed that our room had just been converted from smoking to non-smoking less than 4 weeks ago. Keep in mind, our non-smoking requests are not preferences, but a medical necessity. The R.A.I.N. 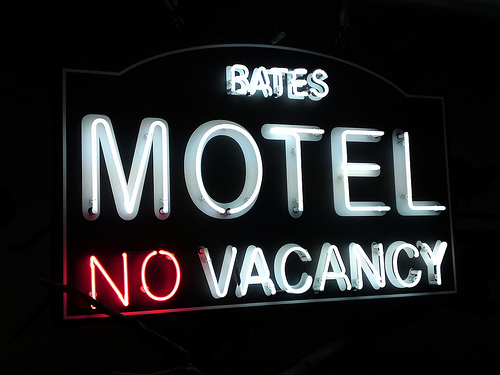 is a big event in Terre Haute, therefore; no vacancies were available at any other hotel. Believe me, husband made numerous calls to verify this. After returning from dinner back to the only room in the city available for our usage, we were once again informed of an additional issue the hotel allegedly had no control over, the elevators were down. No, I don't mean down on the first floor or down the hall. I meant out of order, useless, unable to carry my luggage and bikes up the four flights of stairs to my room that someone could have easily mistaken for a smoky bar. Usually, the night before any of my extreme physical endeavors such as half marathons, 160 mile bike rides, I attempt to reduce my physical activities and rest up for the following day. I guess habits are made to be broken, not that I had a choice. Not my idea of fun! Enough about poor choices in hotel selection, this was my second year of riding R.A.I.N. two Saturdays ago, July 21st. The starting line was at St. Mary of the Woods College, the same location as packet pick up the night before. I find the mass start of any group bike ride intimidating. 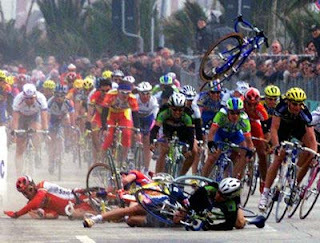 I hate the crowd and closeness of over a 1000 bikes knowing that it only takes less than a mere second for someone to suddenly hit the brakes or someone to forget to unclip at an intersection and cause total chaos. A bit paranoid? Probably! With this summer's heat and humidity, I expected a much warmer start than I was introduced to. As I met up with my uncle about 20 or so miles into the ride and thankfully for me, riders had scattered, we both concurred that it was just flat out cold. We passed each other a couple of times before we met up again at the first rest stop at mile 38, where my SUPER SAG TEAM was eagerly awaiting my husband and I's arrival. Accompanied by his best friend to the right. My SUPER SAG TEAM, or PSV as others may refer to it, consisted of my gorgeous oldest, 17 year old son, his best friend, and my equally gorgeous youngest 14 year old son. 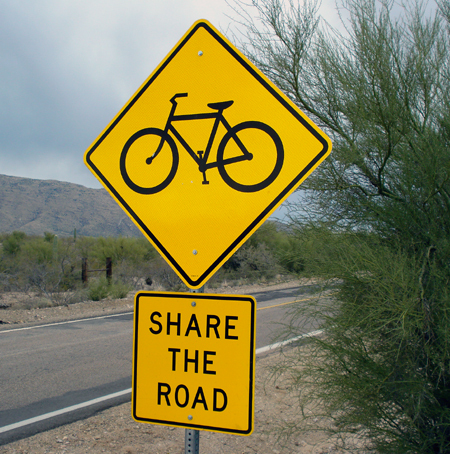 They had specific instructions, #1 being "DO NOT HIT A CYCLIST", especially me or your father. Seriously, he was told under no circumstances were you to get anywhere near a bike. Being that my SAG driver is only 17 years old, I'll admit my confidence lacks because of his lack of experience driving around cyclists and driving period. routing out the game plan. The SUPER SAG TEAM'S second set of instructions were to immediately replenish the handy dandy insulated Polar Bear water bottles with fresh ice and Powerade upon our arrival to the rest stop. While they refilled our water bottles, we would quickly hydrate, eat bananas, trail mix, and whatever else we would obtain from the R.A.I.N. provided rest stop and of course, stand in line for the wonderful port-a-potties. After we felt as though we were adequately ready for the next round of miles, we headed east again into the much higher temperatures than we started with. The temperature increased quickly as did the sun's ability to cook me after I was unable to find the Aveeno sunblock I was positive that I had packed the night prior. 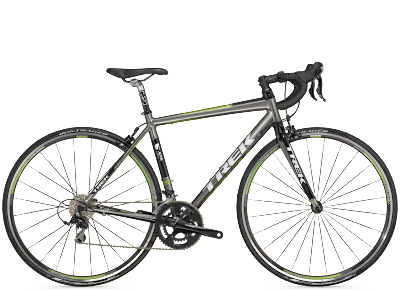 Regardless, we kept pedaling right along on our new Trek road bikes we had just upgraded to just this late March. just wait until mile 150. Why do I mention the new purchase? HA! Just say last year's R.A.I.N. ride was not as efficient as this year's trek (no pun intended), on our old Trek bikes. 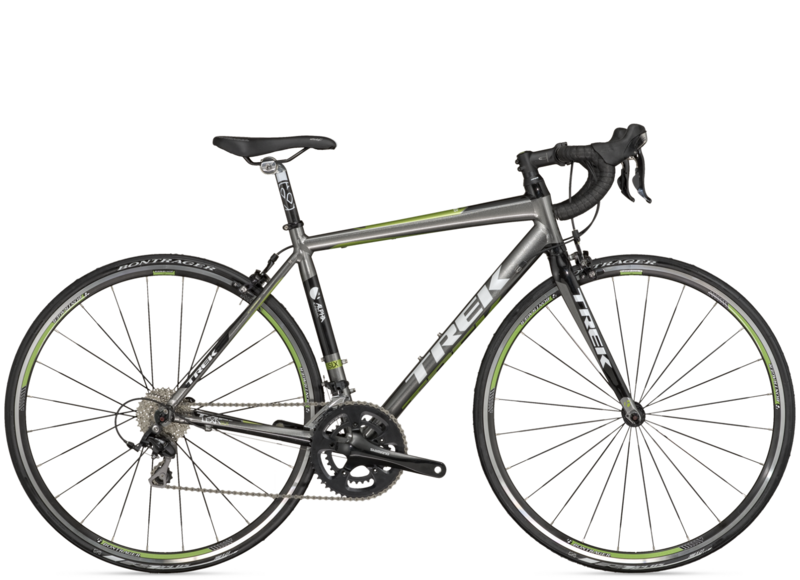 Last year we purchased Trek hybrids, (yes, I said hybrids) approximately one month before the R.A.I.N. We managed to squeeze in a handful of short rides and two, maybe three 50 milers prior to the 2011 R.A.I.N. I'm sure some of you die hard cyclists are thinking we weren't exactly the brightest riders in the group, but believe me....we knew what we were getting into, well kind of.....15 long hours later. Anybody and everybody that knew cycling that we told we were doing R.A.I.N. and those that we told after the fact that we had attempted the R.A.I.N. on hybrids and with very little proper training, somewhat questioned our mental capacity. We did finish, just not before the 9 p.m. cut off time. It was just around 10 p.m. and very dark. With new bikes and a tad more training under our belts, I had every intention on cutting off some serious time this year. I didn't remember the exact time of our arrivals at each rest stop the year prior, but I was well aware we were on the tail end of the majority of the riders. It's a good indicator when there are few riders remaining at the stops and the volunteers are cleaning up. Dear Husband and I leaving rest stop number 1, I think. So, when we came out of the cornfields and headed into more commercial civilization and arrived at our second rest stop at mile 63, I knew we were significantly ahead of last year's schedule. Numerous riders were still present and the volunteers didn't appear to be packing up anytime soon. Woo Hoo! Once again, we hydrated, consumed calories and made sure our bottles were refilled prior to heading out for another 25 miles or so prior to our next stop, lunch. Dear Husband leading the pack. As we pedaled vigorously, O.K.....just pedaled, around the south side of Indy; we came to the same gas station we patronized last year and replenished our ice and water. It was getting hotter by the minute and more difficult to keep hydrated properly. We had sent our wonderful SAG crew home for the time being, as our next stop was just less than 2 miles from our home which was only a block or so off the R.A.I.N. route we were taking. Prior to leaving the gas station, I called the Senior SAG member and informed him of our whereabouts and told him to ensure that our lunch was ready on time, he needed to leave the house in fifteen minutes to place our O'Charley's carry out order and get it home. Our plan worked flawlessly. As we turned the corner to the last main street prior to our home, Senior SAG boy was right behind us in the Super SAG van. I yelled out to my husband and pointed "There's our food!". Just as I did, I noticed the very nearby roadkill and seriously hoped that the other riders didn't think that was what I was referring to. My Cajun Chicken Pasta and bread from O'Charley's was one of the most beautiful moments of the day. After surviving off of the hotel breakfast, then bananas, trail mix, cereal bars & cheese sticks from rest stops and the back of van, our lunch was pure bliss.... that and the house air conditioning. Of course, with ONLY 73 more miles to go, I could use all the additional carb loading I could get. With ONLY 73 more miles to go, I quickly finished my lunch and headed out by myself this time. Dad a.k.a. dear husband took over SUPER SAG duties from my 'very eager to surrender' SUPER SAG TEAM and called his cycling "over" for the day. When we had arrived at home for lunch, I noticed it was around 1:30ish. Remembering that we were just coming upon the actual lunch stop last year right around closing time, 4:00, I knew I was on schedule to at least cut off a couple of hours from last year's finishing time. If I could avoid any issues, wrecks, flat tires, etc., I would succeed! I passed the middle school where lunch was being served and continued my trek alone. At this point, I was somewhat invigorated. I had just had a yummy lunch and an ice cold Diet Dr. Pepper. What more could a girl with a serious diet soda addiction ask for? Well, besides a permanently attached I.V. 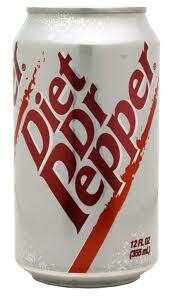 seeping Diet Dr. Pepper into my veins. I rode mostly alone for awhile, with the occasional rider passing and squeezing in a "Hi!" or a quick attempt at a conversation. I did keep more than a minute conversation with a friendly gentleman who informed me this was his first R.A.I.N. or any ride over 100 miles for that matter. I'm all too familiar with that scenario. watched Children of the Corn one too many times. I think he highly considered my intelligence and judgment less than average after my attempt at becoming one with the front of a sedan passing though an intersection that I made the mistake of thinking it was a four way stop. Guessing by the passenger aggressively throwing his arms in the air and the driver giving me a less than lovely look, I don't think I they thought I was a genius either. Hey, I never claimed perfection. Remember? I did this crazy thing on a hybrid and with little training last year. Oh, and did I mention our pedals were not clipless or caged? What do you expect? I never claimed to be Einstein! Besides, he never brushed his hair and I couldn't get away with that. After reclaiming my heart that just fell into my stomach and somewhat gaining my composure as my ninth live passed before my eyes, I ventured forward on my own. I think he was glad to see me go......away; before I got him killed. 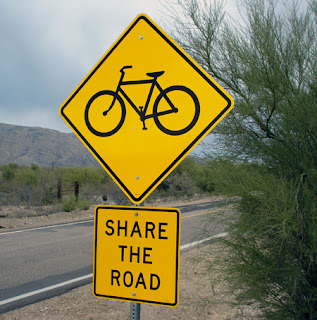 I pedaled on alone, once again, meeting up with my husband a.k.a. substitute SAG every so many miles or so for fresh ice & water along US-40 East. I had skipped the last stop in Greenfield at the golf course. It was only drinks and ice and with my new SAG, he was never too far behind or ahead if I needed either. Bliss on a hot day! I remembered the next stop Dunreith Volunteer Fire Department from last year. 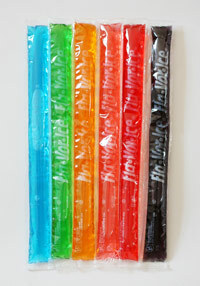 They had the best ever in my 38, ok almost 39, years of life; flavored ice pops. Yes, I said flavored ice pops. You go sit on a bike for hours on end in 90 degree weather and blazing hot sun and see if you can deny those ice pops. With the relentless heat, they were better than my Cajun pasta. While still at Dunreith, I made extra effort to cool off with an ice cold, drenched wash cloth. I wrung it out over my bike helmet. While any other time, it would have been frigid and caused me to screech, it was refreshing and the beginning to my next set of miles. Prior to arriving at Dunreith, I had rode closely behind a group of about 10-12, 2 abreast in what I call synchronized cycling and what I think others refer to as drafting. It was not my intent, or is it ever my intent to intentionally synchronize, ok..draft. To me as mentioned previously, I'm not comfortable with such close proximity to any moving bike. Since most of the time, my pace was right in line with theirs, it was difficult to pass without them attempting the same very shortly thereafter. Therefore; I stayed in my dutiful place and maintained the pace. After Dunreith, I sporadically kept with the group of matching jerseys off and on. I was once welcomed by one of the riders who stayed towards the back who had informed me they were a group from Indy that trained together at one of the YMCA's. Either their pace picked up or mine significantly dropped, because right before Centerville, the R.A.I.N. route detoured off of US 40 and into the land of cornfields, my ability to keep up was all but totally lost. Right about the time I had seen the mile marker informing R.A.I.N. riders we were only 10 miles from the finish, my pace significantly decreased, my legs started shaking and just like during my first half marathon 5 years ago, I wished for spontaneous combustion. I was in serious bonk mode and had hit the wall that most runners refer to in about mile 20 or so of the full marathon. I stopped my bike to the side of the road for a quick break and to see if some Powerade would help alleviate my issues to no avail. I could barely get off my bike, my legs were shaking so bad, I thought I would fall. I drank quickly and with much effort got back onto my bike. My condition didn't change at all as I continued to pedal with as much effort as humanly possible at this point. Obviously, my efforts at fueling and hydrating all day had failed. I continued to watch my bike computer for the change in distance, but like watching water boil or paint dry, not much happened. It seemed as if every 10th of a mile was 10 miles, I felt that bad. I was determined to finish dead or alive, preferably alive. Finally, the marker for 2 miles was up ahead. Even with only 2 miles until finish, I seriously contemplated calling sub SAG or dear husband who I knew was probably at the finish line eagerly waiting to take pictures, to come back and stay near in case I fell over flat. I overcame that thought, knowing I would rather be dragged to the finish and him snap my finishing photo than him to come hunting me down and miss my photo op. Finally, I started to see the finish line behind through my delirious eyes as the crowd cheered on the finishers to the end. Like last year, I secretly declared my love to that Earlham College sign that marked the end to 160 miles. There was nothing more beautiful than the finishing marker. Me, as dear husband takes my finish line photo. Obviously, I couldn't wait to get off the bike. I climbed off my bike as they recorded my finishing time at 8:12 p.m., 13 hours, 12 minutes after the start and roughly 2 hours less than last years unrecorded time. I was handed my prized finishing medal as the R.A.I.N. photographer took my picture. Yes, my husband was there to get it also. After dear husband snapped my less than smiling picture, I handed him the bike and told him to take it away. I handed the approximate 2 ounce finishing medal to my cousin and told her it was too heavy, take it. I was that exhausted, had the overwhelming desire to vomit; which I was capable to suppress and only wanted to find my way to the car that was taking me home. When my uncle and cousin asked if I would be back next year, I only remember giving them the glare of death. Of course, cousin had to remind me that I had given her the same response last year 160 miles later, only to have booked next year's hotel within a week later of the finish. Yes, dear cousin Kelly, the hotel for next year's R.A.I.N. is already booked. I know where I won't be staying. Don't they say the third times the charm, right? Somebody had better be right! When I first started this blog, I wrote on this very page "I can't say I love to run. It is not my passion. I don't wake up to pound the pavement. I wake up to live, enjoy my life with my kids, my husband, my family and friends. I don't hate running." Almost a year later, I can not only say I love to run, I might even claim to have an addiction and that enjoying my life includes running. I run for my health, the sanity it brings, and because I enjoy the races. 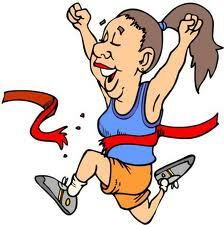 I like the feeling of accomplishment I get from finishing a 5k, a half marathon, etc. I'm not anywhere near fast but I always finish and that's what matters to me. I'm sure one day there will be that one event I don't finish and I'll deal with it then. So, if I'm not fast, where does my blog title originate from? It's Mom Runs Faster Than Dad, not Mom Runs Fast. So, that only means I have to run faster than him, not faster than anyone else. Don't worry, he's not upset about the name of my blog. In fact, he's the one who came up with it. Come back here to listen to my rants and raves about my running, biking, my children, my husband, my doggies and life in general, but mostly my running & biking. I'm sure my children and husband would appreciate me leaving them out of it.